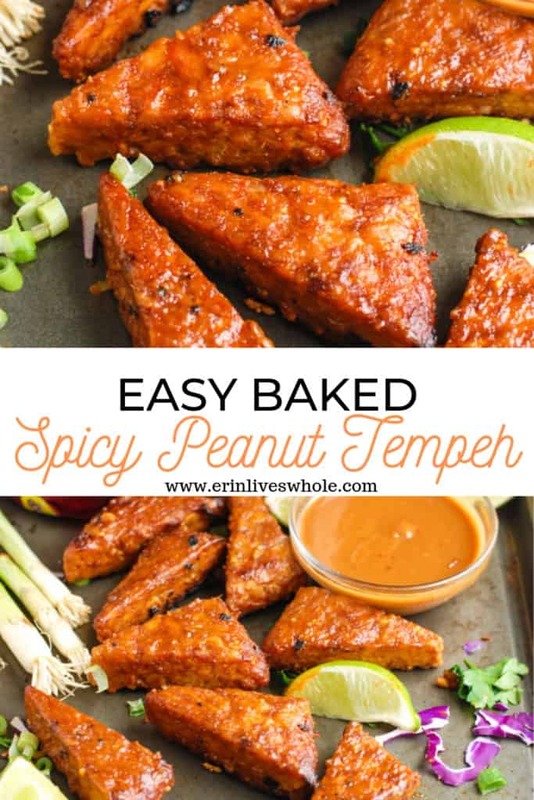 An easy and healthy recipe for spicy peanut tempeh, marinaded for a few hours, then baked and ready to eat! Try it on top of a buddha bowl, in a salad, or with Thai rice noodles! Delicious. 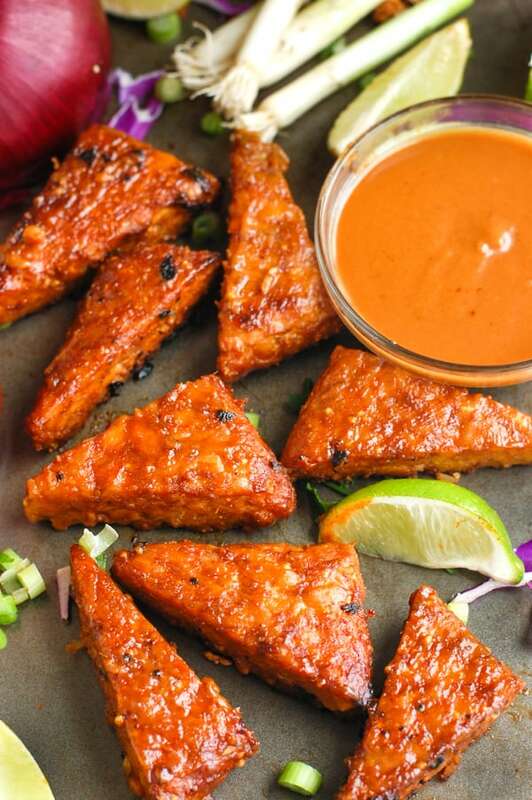 Spicy peanut tempeh is literally a match made in my dreams. Anytime there is a peanut sauce on the menu at a restaurant, I am the first one to order it because I know I will automatically love whatever it is that is doused in that rich, creamy sauce. For example, my Thai turkey meatballs are one of the most popular recipes on my site, and for good reason! The peanut lime sauce that comes with it is basically drinkable. So a few weeks ago when I was at a restaurant that offered tempeh Buddha Bowls that came drizzled with a spicy peanut sauce, I knew I had to have it. Combining two of my favorites into one, with the addition of sweet potatoes and other roasted vegetables is literally my dream meal. Talk about GOOD! So when the bowl came out looking straight out of a magazine, I took one bite and knew I wanted to recreate that tempeh! If you’re new around here and am wondering what the heck even is tempeh, head to this blog post to learn more about it! What is in spicy peanut tempeh? This spicy peanut tempeh sauce is made up of so many delicious ingredients like peanut butter (duh! ), soy sauce to bring some salty flavor, sriracha for a little heat, maple syrup for a little sweetness, lime for the perfect acid, and ginger + sesame oil for those extra Asian flavors. The combination of all of these is literally a match made in heaven. 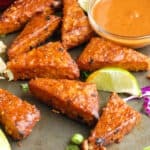 How do I make spicy peanut tempeh? Marinade, marinade, marinade! 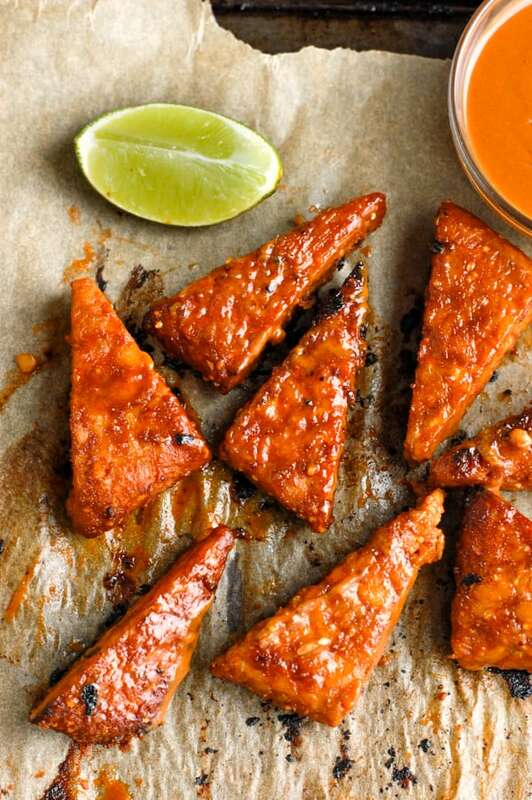 This is the first tempeh recipe where I am suggesting that you use a marinade for your tempeh. The longer it sits, the more flavor it will have, and while the other recipes only require a simple bake, this one really benefits from a marinade. All you need to do is combine all of your sauce ingredients into a bowl, chop up tempeh (pre-steamed) into whatever shape you desire (I did triangles here) and add the tempeh to the bowl, making sure it is completely coated. You can let is sit in the refrigerator for minimum two hours but I wouldn’t keep it in longer than 12 either. I always find that four tends to be my sweet spot. Since it’s already sliced up, you just place it onto a baking sheet, drizzle the remaining marinade over the top, and then bake! Easy enough! And goes well with rice noodles, roasted veggies, on top of a salad, or in a Buddha bowl. 1. 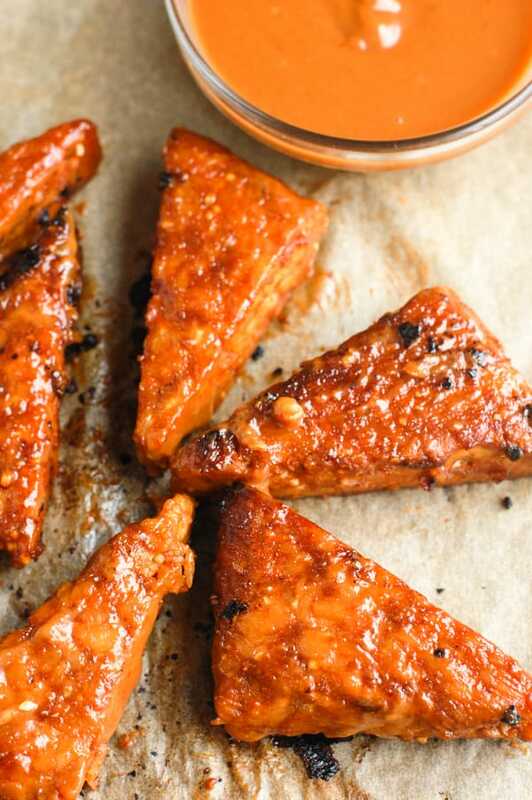 Chop up tempeh in triangles or slices. 2. In a large bowl, whisk together all ingredients except tempeh. 3. Add in tempeh and toss to coat, making sure sauce is evenly distributed among tempeh. 4. Refrigerate for minimum 2 hours and maximum 12. 5. Once marinated, place onto parchment lined baking sheet and pour left over marinade on top. 6. Bake for 20 minutes at 375F. 7. Serve immediately! I like mine on salads, in bowls, with veggies, and with rice noodles.